Dell's Latitude range has long been popular with businesses, thanks to low costs, the availability of different conﬁgurations and a common range of compatible peripherals. The Dell Latitude E6400 (£853 inc. VAT) is the ﬁrst machine we've seen since the range has been overhauled and ﬁrst impressions are favourable. The 14.1-inch screen and the use of a regular TFT panel makes it easy to use in all conditions. Ambient backlighting dims the display automatically depending on conditions to help prolong the battery life. We found it too sensitive, however, changing the brightness too often for comfortable use. The resolution of 1440 x 900 pixels creates sharp images, and colours are recreated faithfully. Graphics are provided by an Intel GMA 4500MHD chip. This integrated GPU helps to offer an excellent battery life of over ﬁve hours. The keyboard features a tactile rubber-like ﬁnish and provides effortless comfort. The keys are big and ﬁrmly attached. You'll ﬁnd a small rubber Pointing Stick in the centre of the keyboard, offering an alternate way of control for those not comfortable using the touchpad. The Latitude is aimed at mainstream users and its design is understated. Magnesium-alloy is used for large parts of the chassis, giving more than enough robustness for the daily commute. You'll also ﬁnd zinc hinges in place, which Dell claims are far stronger than traditional hinges. Despite this, the 2.4kg weight is still reasonable for regular journeys. The E6400 is at its most impressive when it comes to everyday use. There's a 2.26GHz Intel Core 2 Duo processor in place that makes short work of multi-tasking. It's second only to the Sony in terms of performance and, unrestricted by size or ventilation issues, it's a great choice for those needing to carry out intensive tasks. A biometric ﬁngerprint scanner offers protection for your ﬁles, and it's neatly integrated into the right-hand side of the chassis. Networking features are comprehensive, with 802.11n Wi-Fi and Gigabit Ethernet. Files can be transferred easily using the 5-in-1 media card reader, and you'll also be able to connect wirelessly to your phone and other digital devices via Bluetooth. 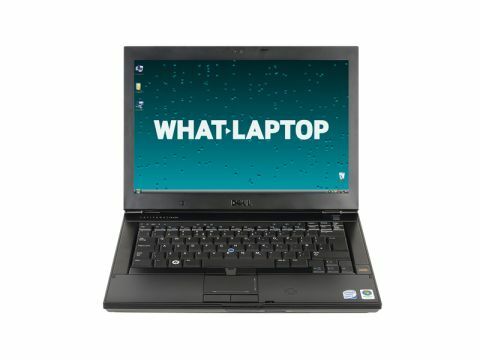 The Dell Latitude E6400 may lack the style of some other laptops, but it's every bit as good. Excellent performance makes it an effective machine for power users, and you'll also ﬁnd impressive quality and usability.